1864: The Dunkin Act, or the Canada Temperance Act (1864), is passed, allowing any counties or municipalities to prohibit the retail sale of alcohol if supported by a majority vote. 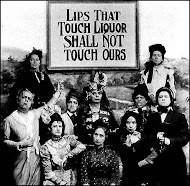 1874: The Women’s Christian Temperance Union is formed. 1875: Hundreds of religious groups and societies across Canada from the Dominion Prohibitory Council in Montréal (later renamed the Dominion Alliance for the Total Suppression of Liquor Traffic). 1878: The Scott Act, or the Canada Temperance Act (1878), is passed, extending the first Canada Temperance Act Nationwide. , Laurier did not enact any prohibition laws. 1901: PEI becomes the first province to enact prohibition (they had voted only 20% against in the 1898 referendum). 1915-1917: Each province (except Quebec, including Yukon) enacts prohibition under the War Measures Act (1914), which limited the freedom of Canadians. Prohibition in each province had different terms, for example in Ontario, under the Ontario Temperance Act (1916) brewing or distilling of liquor was not forbidden, they were allowed to export it out of province, but not sell it in Ontario (as the provincial government has do jurisdiction of liquor outside the province of Ontario). 1918: The Canadian government bans interprovincial trade of liquor, as under the previous separate provincial system, the government of each province could not legislate out of their province. 1919: Ontario holds a referendum on prohibition, but keeps it because of a plebiscite vote. Quebec prohibits the sale only of spirits due to the results of a 1919 referendum on the subject of prohibition. 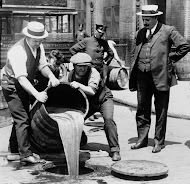 1921: Both Quebec and BC switch their prohibition systems (Quebec have prohibited only spirits, and BC prohibited all liquor) to government controlled liquor systems, on which is the basis of the systems that exist today. 1923: Manitoba ends its Noble Experiment, switching to government controlled system. 1924: Alberta and Saskatchewan follow suit, with them too switching to a system of provincial control. 1927: Ontario is the last southern province to end prohibition, as they switch to the provincial control system, inaugurating the Liquor Control Board of Ontario (otherwise known as the LCBO). 1948: PEI ends their nearly half a century of prohibition.